Healthy ecosystems increase the resilience of communities; their degradation can exacerbate climate impacts and place populations at risk. Photo credit: ADB. Why are people in Asia and the Pacific particularly vulnerable to climate change? The answers may lie in a combination of factors that literally creates a “perfect storm”: a high incidence of poverty, reliance on climate-sensitive livelihoods, water, food and energy insecurity, and dense populations concentrated in flood, cyclone, and drought-prone areas. Widespread degradation of the region’s ecosystems and high rate of biodiversity loss increase this vulnerability. Future climate impact assessments are not looking rosy. According to the Potsdam Insitute for Climate Research and the Asian Development Bank (ADB), more intense typhoons and tropical cyclones are expected to hit the region because of rising global mean temperatures. Under a business-as-usual scenario, annual precipitation is expected to increase by up to 50% over most land areas in the region. Countries like Pakistan and Afghanistan may experience a decline in rainfall by 20-50%. Coastal and low-lying areas will be at increased risk of flooding. Nineteen of the 25 cities most exposed to a one-meter sea-level rise are located in the region, 7 of which are in the Philippines alone. Indonesia, however, will be the most affected by flooding with approximately 5.9 million people expected to be affected every year until 2100. Ironically, while flooding is predicted to increase in the Asian monsoon region, water shortages are also expected, because of projected changes in climate exacerbated by growing water demand from rapid population and economic growth. As weather patterns change, more rivers, lakes, wetlands and aquifers are expected to dry up, and water systems will become increasingly stressed in regions susceptible to drought. Adapting to a warming climate and preparing for the onslaught of extreme weather events has now become the “new normal” for countries in the region. Traditional strategies to minimize climate threats and impacts focus on hard engineering—building physical or hard-engineered grey infrastructure such as seawalls to protect against rising sea levels and storm surges, or improving dams and irrigation infrastructure to secure freshwater supplies. These are complemented with “soft” approaches including the use of policies and legislation, such as regulating development and land use, integrating early warning systems, and improving the disaster risk and preparedness capacity of communities. Over the past decade, nature-based solutions—such as the conservation, restoration and sustainable management of natural ecosystems e.g. forests, river basins, coral reefs, mangroves, and wetlands, to reduce vulnerability to climate impacts, have gained increasing attention. These emerging solutions, which include sustainable agriculture, aquaculture and water resource management, can offer cost-effective protection while delivering “co-benefits” such as reduced greenhouse gas emissions, improved food and water security and increased opportunities for livelihood and recreation which all contribute to human well-being. While some countries around the world, have started to implement nature-based solutions as part of their wider risk reduction and climate adaptation strategies, nature-based solutions have yet to be routinely considered or included as part of a standard suite of potential solutions to flooding erosion and drought. In many cases, a combination of nature-based solutions, hard engineered or grey infrastructure, soft approaches, and technology (where possible) have shown to work best. In Asia and the Pacific, nature-based solutions are still emerging. While a few large-scale nature-based solution projects are coming online, most are still pilot demonstrations and experimental. How do ecosystems protect and help buffer against climate change impacts? Healthy, well-functioning ecosystems are naturally resilient to environmental and climatic changes; their destruction and degradation can exacerbate climate impacts and place populations at risk. Land, for instance, if constantly converted from forests and grasslands for agriculture and industrial use or residential developments loses the ability to absorb and regulate rainfall. Coastal habitats provide buffer against waves, support fisheries, cultural, and recreation activities. Natural and constructed wetlands have proven effective at reducing and removing pollutants, nutrients, and microbial contaminants thus improving downstream water quality. They filter sediments and organic matter washed off during storms and can become permanent, much-needed sinks for these substances. Bioswales—vegetated channels that convey stormwater - can reduce peak flows up to 89%. A new assessment from the National Academies of Sciences in the United States states that because wetlands: mangroves, tidal areas, and seagrass beds contain the highest carbon stocks per unit area of any ecosystem, creating new wetlands and restoring fringe areas have the potential to more than double the current rate of carbon absorbed from the atmosphere. And at around $20 a tonne, this is probably one of the lowest cost options for capturing carbon. Unfortunately these coastal ecosystems are some of the most threatened areas on earth, and when degraded, become significant sources of emissions. What are some examples of using nature-based solutions to minimize climate threats and impacts? Nature-based solutions are not restricted to the restoration of large natural ecosystems or protected areas; they can be used across a range of sectors (water, energy, and transport) and scenarios, from megacities to small remote coastal communities. They can involve rivers, streams and floodplains, mangroves, seagrasses, oyster and coral reefs, green roofs, streets, and parking lots, among others. For example, the Sponge Cities Initiative in the People’s Republic of China (PRC) focuses on using “green infrastructure” e.g. permeable pavements, green roofs, parks and, tree planting, and constructed or natural wetlands in its flood and drought-prone cities. Hard impervious concrete pavements and streets in PRC cities often block the natural flow of water and quickly convert rainfall to surface run-off which then overwhelms drainage systems and causes flooding. Permeable surfaces, on the other hand, reduce surface runoff and trees and vegetation, increase water infiltration into soils and help recharge aquifers, mitigate floods and let cities breathe. These will soak up and store water, which can then be used to recharge aquifers, water gardens and irrigate farms. Since 2013, the cadre of sponge cities has doubled to 30, including megacities Beijing, Shanghai and Xinjiang. Early test areas proved able to reduce 85 percent of annual runoff, mitigating floods while purifying, conserving and recharging groundwater for later. An ADB project in Pingxiang, PRC, is helping protect floodplains, restore wetlands, and create wider green spaces along rivers. The project aims to address flooding, river pollution, untreated wastewater, and lack of rural-urban linkages in an integrated manner. Sponge cities to mitigate flood risk and better manage rainwater resources can have applications all over Asia. Photo credit: ADB. An ADB project in Northern Viet Nam that ran from 2013-2016 demonstrated how simple bioengineering i.e. using locally grown vetiver grass and brush layers can protect riverbanks from erosion during major floods, especially when combined with appropriate strengthening techniques for slopes and riverbed riprap. This nature-based solution came out as far cheaper than conventional concrete, was wildlife-friendly, and provided economic products such as leaves for roofing or fodder. Climate-resilient infrastructure in rural Viet Nam. Photo Credit: The International Centre for Environmental Management. ADB is supporting the preparation of design options for large-scale river basin management for the governments of Indonesia and the Philippines, which include nature-based solutions and grey infrastructure solutions for flood protection. ADB is also working with the Government of Punjab, Pakistan address water pollution and river health in the Ravi River Basin through development of a multi-stakeholder vision for the basin supported by a holistic ecological flows model and identifying wastewater treatment options (e.g., combined low-cost bio-remediation and conventional treatment for large municipal wastewater drains; bioremediation wetlands in rural areas). After the 2004 Indian Ocean Tsunami devastated coastal communities and ecosystems in Indonesia, Sri Lanka, India, Thailand and Malaysia, Oxfam Novid (Netherlands) funded the 5 million euro ‘Green Coast’ project to restore and manage damaged coastal ecosystems in the five countries, build and restore sustainable livelihoods resilient to climate change, carry out environmental education campaigns and develop village regulations for conservation. As of March 2009, more than 1,100 hectares of coastland had been rehabilitated through planting of mangroves and coastal forests, as well as 2.5 km of sand dunes and one hundred hectares of coral reef and seagrass beds were restored and protected. Communities were also trained on alternative livelihoods, such as fishing, aquaculture, eco-enterprises, home gardening and pastoral farming. Overall the project was considered successful for helping increase resilience to climate change for 91,000 people and improve livelihoods for 12,000 households in the region. What are the benefits of nature-based solutions? In addition to helping people cope and adapt to climate change, using nature-based solutions often results in an over-all improvement in environmental co-benefits such as biodiversity conservation, food, water, and energy security, higher recreational, aesthetic, and tourism values, and stronger local economies. Sustainable land management techniques in drylands can lead to benefits such as improved food security, which allows people to invest in better living conditions and education, while reducing the need for migration. A cost-benefit evaluation of Watershed Development for the Kumbharwadi rain-fed watershed in Maharashtra state, India showed resulting market-benefits which included: improved crop and livestock sales; avoided travel cost for migratory work and drinking water; avoided cost of government supplied water tankers, and improved fuel wood and fodder supplies. Non-market benefits included: carbon sequestration, a co-benefit of afforestation and reforestation; improved biodiversity, pollination and water filtration; improved nutrition and health; increased enrollment in education due to improved income; female empowerment; community development and improved resilience to drought. A comparative analysis of proposed flood protection measures for a flood-prone area of Viet Nam, in anticipation of a 12-centimeter rise in sea level by 2020, found that building a system of sea dikes would cost about D138.8 million per person, compared to only D1.7 million per person for a reforestation and conservation program. Nature-based solutions are flexible and can dynamically adapt or respond to a changing environment and climate. For example, mangrove forests and tidal saltmarshes trap sediment and keep pace with rising sea levels. Likewise, ecosystems within catchment areas can adjust to climatic conditions maintaining their role in reducing soil erosion and improving downstream water quality. Are nature-based solutions therefore better than hard engineered infrastructure? What about hybrid solutions? Nature-based solutions usually require more land or sea space than purpose-built engineering structures. Restoring mangrove forests requires hundreds, or thousands of hectares, to achieve reasonable protection levels. Longer lead times are needed before such solutions become fully functional. Catchment restoration to improve and manage flood risk takes decades. Planting trees to cool down cities may take years to reach its full potential. There is always uncertainty to the eventual performance and final results of nature-based solutions under different climate scenarios. The same goes for hard-engineered infrastructure. Where space and time are limited, hard engineering infrastructure may be the only solution possible. In other contexts, it could be that nature-based solutions are the only viable or available alternative for a community. For example, Taro—the atoll island and provincial capital of Choiseul Province in the Solomon Islands—counts rising sea levels and coastal erosion as its major problems but the construction of seawalls and dykes are simply beyond its available physical and economic resources. When deciding on the appropriate response for a particular situation or location, all possible forms of risk reduction and adaptation measures should be considered. Depending on the hazard, combinations of nature-based solutions and hard engineering and soft approaches may be needed to provide optimal risk reduction. In cities, where space is limited, even small areas of mangroves offer some protection from waves, reducing construction and maintenance costs for hard infrastructure behind them. In all these settings, mangroves add additional value in the form of enhanced fisheries, carbon storage, forest products and recreation. Mangroves thus support food security, climate change mitigation and human well-being and can enhance recovery after major hazards. One example is the restoration of nearly 9000 hectares of mangroves by the Vietnam chapter of the International Federation of Red Cross Societies from 1993 to 2010, in order to protect 100 km of sea-dykes and coastal assets. Logging and shrimp farm activity had resulted in the large-scale deforestation of mangroves. Resulting Benefit-Cost Ratios after mangrove restoration were high, varying from 3:1 to 28:1. The three communities hit by similar storms before and after the reforestation experienced much less flood and sea dyke damage, the avoided damage in these communities was estimated at £53,000 to £196,000. What are the barriers, and the way forward, to the wider use of nature-based solutions for adaptation? 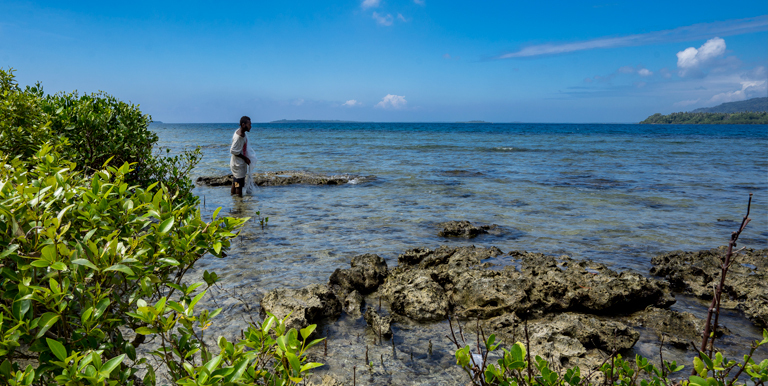 Ideally, Asia-Pacific countries can help people adapt to the impacts of climate change and receive multiple co-benefits while investing in the resilience of their ecosystems and biodiversity. However, it has been perceived that nature-based solutions provide a lower standard of service than hard engineering. Though in cases, such as the managed coastal dunes in the Netherlands, nature-based solutions may provide levels as high as traditional hard engineering structures (achieving a 1 in 10,000-year standard of protection in some places). Conventional infrastructure remains the default for most decision-makers due to the lack of awareness and documented case studies around the long-term effectiveness of nature-based solutions. As well, there is a well-established market-system for the construction and implementation of hard infrastructure, while only few agencies and constructing companies are engaged or have expertise in nature-based solution measures. Underpinning this is a lack of understanding and knowledge among decision makers, public planners, and engineers around Nature-base Solutions as well as the risks and impacts of climate change and the value of ecosystems and biodiversity to adaptation. Despite these challenges, nature-based solutions are gaining credibility and increasingly being applied in major economies, such as the PRC’s Sponge Cities concept and other examples mentioned. In addition, a thriving market for climate/green bonds holds the potential to channel significant private sector investment toward nature-based solutions. As ADB scales up its climate operations and integrates climate mitigation and adaptation into project operations, we will support developing member countries with comprehensive approaches to increase and improve climate and disaster resilience. Nature-based solutions, combined with infrastructure, climate-proofing, clean technologies, policy reform, and capacity-building will be an important part of these integrated strategies. ADB and Potsdam Institute for Climate Impact Research. 2017. A Region At Risk: The Human Dimensions of Climate change in Asia and the Pacific. Manila. ADB. 2016. Nature-Based Solutions for Building Resilience in Towns and Cities: Case Studies from the Greater Mekong Subregion. Manila. ADB. Viet Nam: Promoting Climate Resilient Rural Infrastructure in the Northern Mountain Provinces. ADB. Indonesia: Enhanced Water Security Investment Project. ADB. Philippines: Integrated Flood Risk Management Sector Project. ADB. Pakistan: Revitalizing the Ecosystem of Ravi River Basin. C. Reij, et al. 2009. Agroenvironmental transformation in the Sahel. International Food Policy Research Institute Discussion Paper. D. Ponzi, X Lu, and C Rodgers. 2017. Building Resilience with Nature. Asian Development Blog. E. Gray and A. Srinidhi. 2013. Watershed Development in India: Economic Valuation and Adaptation Considerations. Working Paper. Washington, DC: World Resources Institute. GIZ. 2017. Best Practices on Planning,Implementing and Monitoring & Evaluating Ecosystem-based Adaptation to Climate Change. J. Workman. 2017. Sponge cities: can China’s model go global? Cities Today Knowledge Portal. K. Wilson. 2017. Soaking it Up. China Daily USA. 21 July. Pontee, N.I., Narayan, S., Beck, M., Hosking A.H., 2016. Building with nature: Lessons from around the world. Maritime Engineering Journal. United Nations Environment Programme. 2015. Community-based habitat restoration: the Green Coast Project. Coastal Ecosystem-Based Adaptation Case Study. United States National Academies of Sciences, Engineering, and Medicine. 2018. Negative Emissions Technologies and Reliable Sequestration: A Research Agenda. Washington, DC: The National Academies Press.